The European Agency for Safety and Health at Work (EU-OSHA) has confirmed the first wave of official campaign and media partners to join its 2016-17 pan-European campaign, Healthy Workplaces for All Ages. The network of official campaign partners is made up of European and international companies and organisations representing a variety of sectors including employers’ and workers’ federations, technology platforms, non-governmental organisations and multinationals. Campaign media partners have also joined to help raise awareness via their publications and the Internet. 27% of EU workers think that they would not be able to do the same job until the age of 60. We need to improve the working lives of all generations of workers, promoting sustainable work and healthy ageing. The Healthy Workplaces for All Ages campaign focuses on sustainable working lives in the context of Europe’s ageing workforce. Prevention throughout the working life is a key message, with risk assessment as the basis of preventing workplace accidents and diseases, combined with rehabilitation, return to work and life-long learning. The first wave of official campaign partners to get on board is largely made up of organisations that have renewed their commitment following their successful participation in the 2014-15 Healthy Workplaces Manage Stress campaign. They stand to benefit from the many advantages that the partnership offers including increased visibility, campaign tools and materials, networking and learning exchange. Official campaign partners also have the opportunity to partake in numerous events and activities, among which is the chance to compete in the special campaign partners’ category for the Healthy Workplaces Good Practice Awards. Good practice exchange events organised by the partners themselves will also be held regularly throughout the campaign. They are an occasion for organisations to discuss and learn from each other about successful OSH management practices in relation to ageing in the workplace. The campaign foresees a second wave of partners coming on board in autumn 2016. EU-OSHA encourages interested parties to apply online until 30 September 2016. The media partners who have joined the campaign so far comprise journalists and editors involved in OSH across Europe, who use their networks and print, online and social media channels to help promote the campaign and its messages. They also organise events, include campaign material in training courses, promote the European Good Practice Awards competition and encourage nominations. Does your organisation want to promote its corporate responsibility and occupational safety and health actions to a wide-ranging audience, and network with like-minded international groups? 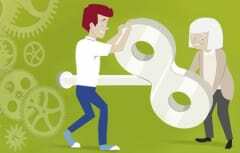 If so, apply now to become a partner of the Healthy Workplaces for All Ages Campaign . You will be joining more than 75 official campaign partners, including multinational companies and public bodies, and 30 pan-European campaign media partners. Apply before 30 September 2016 to become an official campaign partner.